I've had the pleasure to work on a variety of custom furnishings, and below are some of the most inspired. Each piece was built to unite a client's personal specifications and the natural beauty of the wood. 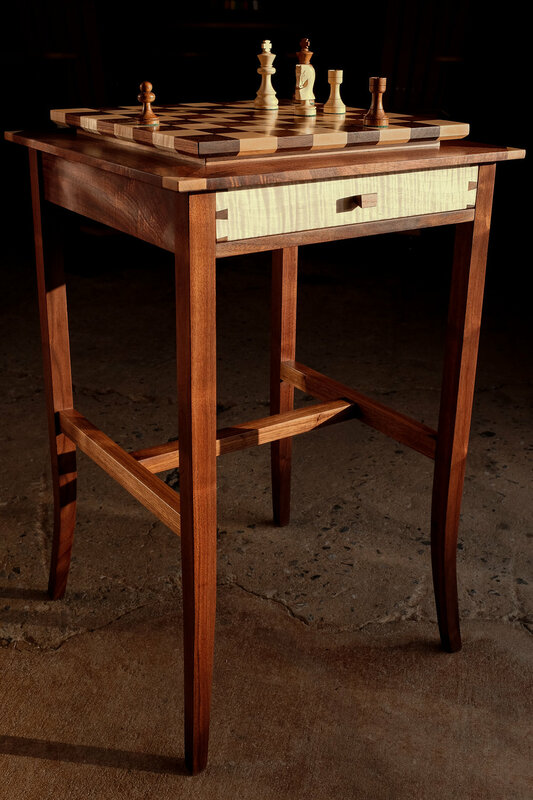 A chess table in walnut and curly maple. The playing surface is solid wood with internal joinery between each square and is friction fit in a floated mitered frame so it can be removed and used on another surface if preferred. 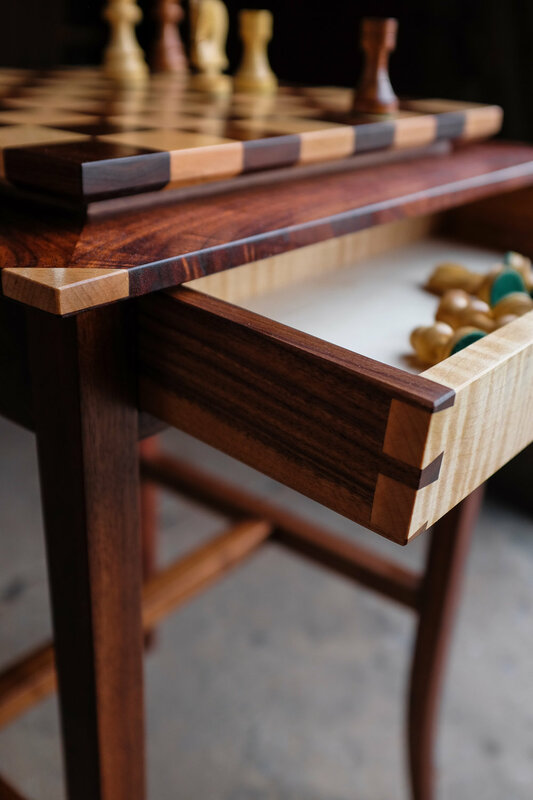 The recessed walnut frame makes a perfect place for captured pieces. One drawer of maple with walnut sides, and one drawer of walnut with maple sides organizes the traditional Russian style pieces. Maple splines and angular wooden pulls tie it all together and make for an elegant experience. Detail of maple splines and walnut subframe. The board slides out of the table to be used on another surface if preferred. Detail of curly make drawer front with walnut sides. 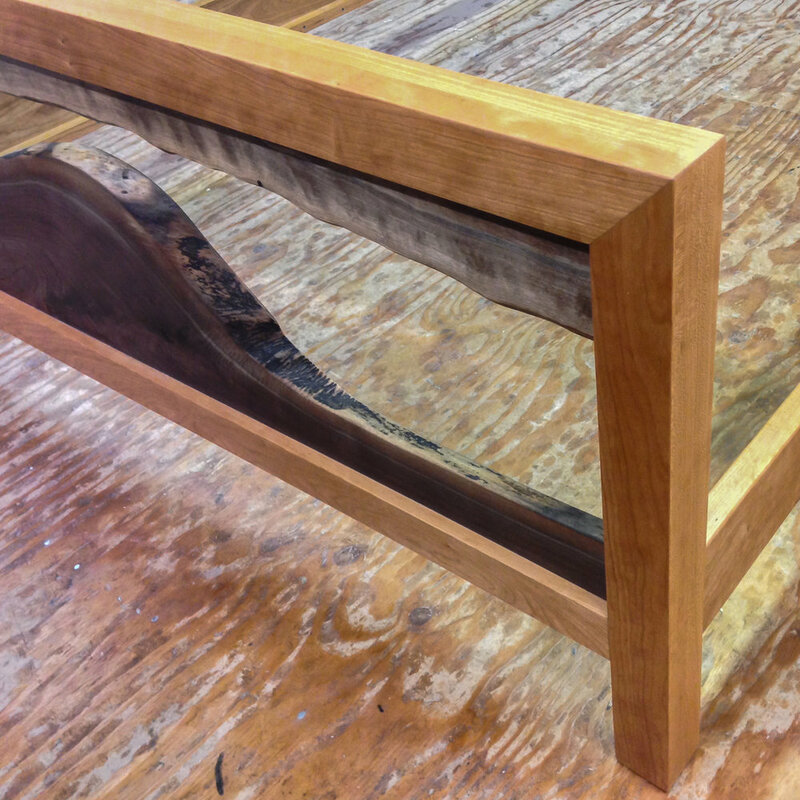 A drawer on the other side of the piece features a walnut front and maple sides, for corresponding pieces. An angled walnut headboard for a platform bed design. Detail of foot rail and foot post on walnut bed. Detail of walnut headboard and post. The sapwood is featured to give the headboard a natural and fluid appearance. A pair of danish modern inspired cherry cabinets. With raised panel shaker doors, this design was an attempt to blend shaker simplicity with danish modern proportion. Detail of the door panel margins. Detail of the cabinet base. A live edge headboard in ash with attached cherry nightstands featuring elm tops. 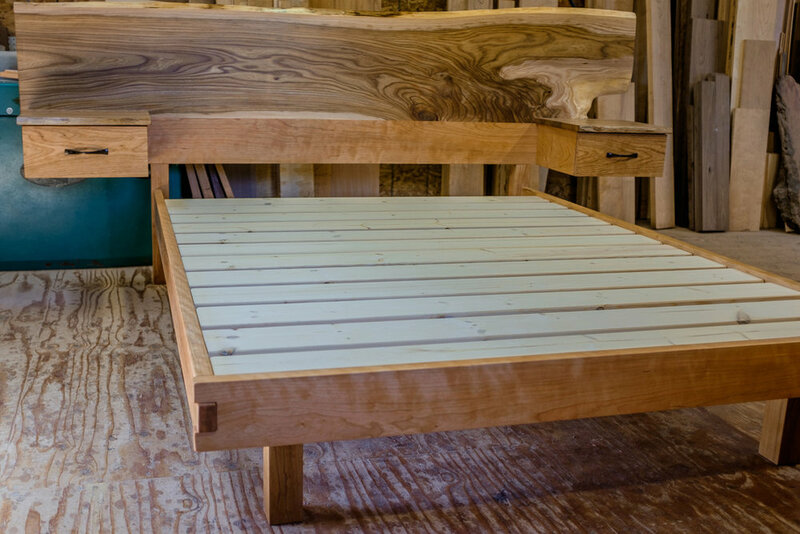 This bed has a platform construction and a cherry frame, with a unique box jointed foot rail and recessed foot posts. Night stand cubby detail with elm top, the boxes are detachable from the headboard for easier transport. Detail of box joint on cherry foot and side rails, with recessed post. Salvaged redwood hanging shelf with dovetail walnut box featuring sliding pocket doors. The redwood live edge of the redwood tells of fire, I retained the blackened edge. Detail of sliding door on box compartment. Detail of dovetail and burned live edge on redwood. The “Mia” dresser, shown here as a three drawer in walnut with dovetailed top and brass drawer pulls. 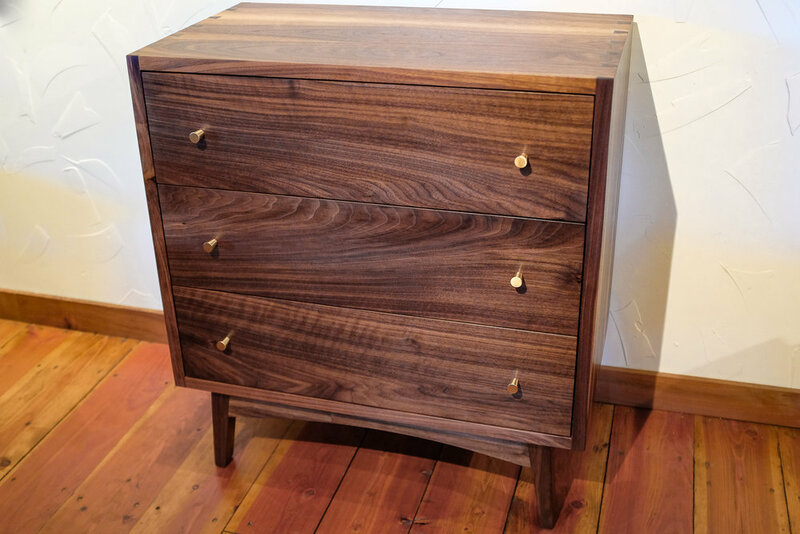 Available in different sizes and configurations (4/6/8 drawer), this piece blends the modern and the craft, retaining the lighter sap wood of the walnut for a bit of exotic character. Currently available at Made in Pescadero exclusively by Stultz Woodwork. Cherry music stand with adjustable height and tilt. Featuring walnut and brass accents. Detail of the sheet music tray. Detail of the tilt adjustment and height adjustment pins. Hanging walnut box shelf with sliding pocket doors and a dovetail box. Detail of door and figured walnut grain on shelf. Detail of dovetail and recessed sliding door. Live edge walnut bar table with steel base. Detail of butterfly keys on walnut bartop. Shoji doors in maple with frosted glass. These were installed into a walk in closet. Custom walnut pedal board for guitar effects pedals. It is inspired by wooden end caps on vintage synthesizers and has an underside mounted power supply and wired input/ouput jacks on one side panel. A bleached white oak coffee table, with a lower shelf. Walnut bed frame with box jointed footboard and recessed foot posts. Cherry six drawer dresser with walnut legs. Side table featuring a floating mahogany top with a push thru walnut drawer and lower shelf. Custom cherry cabinet with adjustable shelves and glass doors. Dovetail walnut case with a live edge shelves incorporated and curly maple dividers. Dovetail walnut case with a live edge shelf and curly maple divider. Claro walnut dresser with book matched drawer fronts. 6.5 ft curly cherry bench top on a trestle base. Detail of curly cherry bench top. Claro walnut bookmatched headboard and footboard panels with a cherry bedframe. Cherry desk with walnut legs, pencil drawer, two lower file drawers, and pull out writing surface. 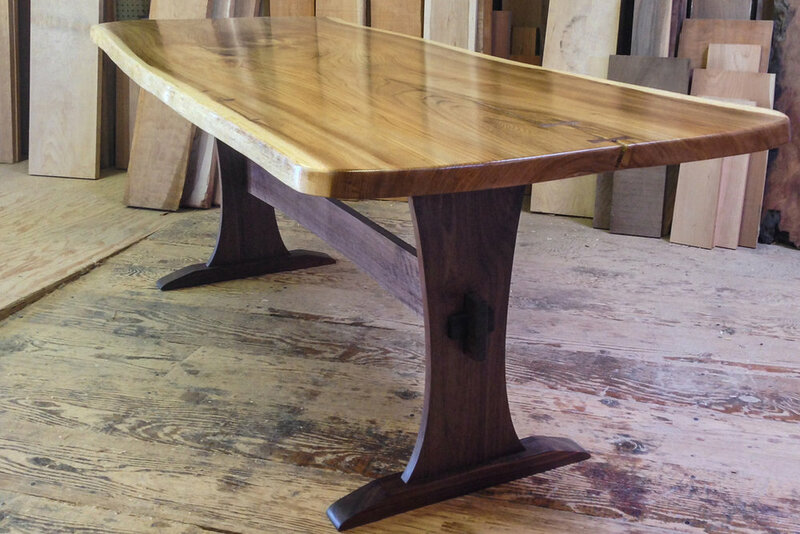 Live edge elm slab table top with a walnut trestle base. Curly cherry table with arched legs and matching bench. Cherry bed frame with quilted maple headboard panel. Detail of a cherry night stand with one drawer and adjustable shelf. Detail of a stepped cherry shelving unit with dovetail corners, walnut legs and bookends. 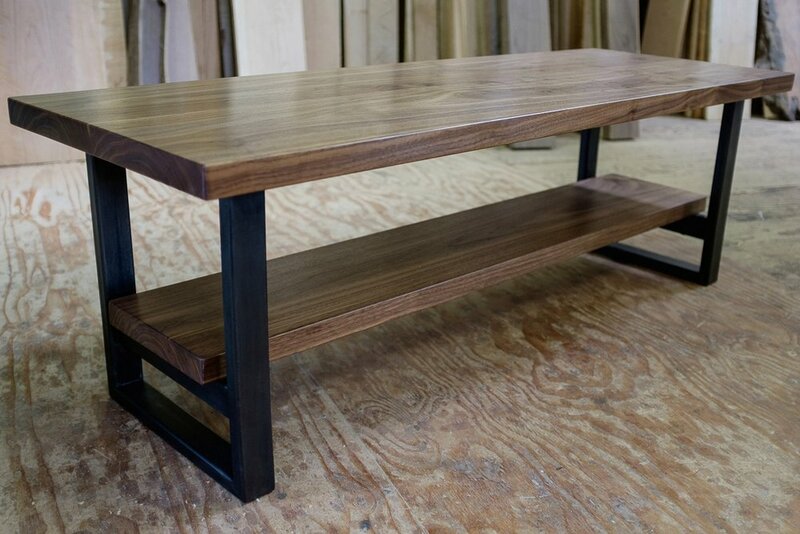 Walnut coffee table with steel base. Mahogany platform bed with box joint footboard and recessed legs. Detail of a tiered bookshelf with dovetail case, and curly maple supports. Curly maple and walnut floating chess boards. The boards are retained into a mitered and splined frame by four steel rods. Live edge cottonwood slab on a reclaimed Singer sewing machine base. A flamed birch top on a 6 drawer walnut dresser. A sideboard with three upper drawers and an adjustable lower shelf in an all cherry design. Cherry hall tree with built in bench and adjustable shoe shelf. Detail of a lower drawer on a rolling recording studio equipment rack made from maple. An adjustable shelf and open end on a cherry case with curly maple top and door panels. Desk detail with quilted maple top and cherry legs. Featured pull out writing surfaces on top of both banks of drawers and a central sliding keyboard drawer.